Have you ever wanted to learn to cook like an Italian? 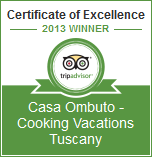 Well our award winning cooking classes in Tuscany offer a unique opportunity to experience at first hand authentic Italian regional cooking techniques and recipes that have been developed and handed down over generations. Our Cooking classes in Tuscany have been rated by The Observer newspaper as one of the "Top ten cookery schools in Europe". This confirms our belief that we offer the highest quality cooking classes available in Europe. Our cooking classes in Tuscany take place in beautiful Casa Ombuto or Torre del Tartufo, both recently restored large Tuscan villas set in a wonderfully tranquil location in the hills of the Casentino valley some 50km south of Florence. Immerse yourself in the culture and lifestyle of Tuscany and learn to cook authentic Italian dishes in an informal and friendly environment. You will learn the passion of the Italian kitchen and, importantly, have a lot of fun and enjoyment doing it. The cooking classes in Tuscany are taught by Paola Baccetti in Casa Ombuto a locally born chef who ran her own successful restaurant in nearby Bibbiena for 10 years and by Franco Palandra in Torre del Tartufo who has year of experience in Italian cuisine both locally and abroad. Our chefs cooking classes in Tuscany offer comprehensive hands on courses designed to teach you to make splendid 4 course Italian dinners covering all the basic Italian cooking techniques, from pasta to pastries and everything in between. The cooking classes are given in the "Cantina" of Casa Ombuto or Torre del Tartufo. All of the ingredients you will use are bought each morning from local markets and so you will be working with fruit and vegetables in season. Throughout our cooking classes in Tuscany you will learn about the ingredients and the traditions around the dishes as well as food presentation and wine choice. The cooking classes in Tuscany run from Saturday to Saturday in Casa Ombuto and Sunday to Sunday in Torre del Tartufo and include 4 elaborate hands-on cooking sessions with enough time to relax and enjoy the surroundings. A one-day excursion will be organized to visit a vineyard for wine tasting, as well as to a local producer of olive oil and to an authentic goat cheese farm. It is also possible to bring along a non-participating partner who can spend the days sightseeing, playing golf or enjoying the heated swimming pool and then rejoin the party for the evening meals. We now also offer a Mediterranean Cookery Course designed to teach you how to cook dishes from the most delicious cuisines found around Mediterranean Sea: Italian, French, Spanish and North African. If you are looking for expertly taught cooking classes in Tuscany that will enthuse you with the knowledge and desire to cook authentic Italian cuisine then look no further. Find out more about our cooking classes in Tuscany here. Alternatively, go straight to our Tuscookany dates page, and start dreaming of your Italian cooking classes in Tuscany.